He is a Real American. Barring a return to the WWE after his TNA contract expires, Hulk Hogan’s last appearance for the company that propelled him to stardom looked something like this. After Hogan defeated Vince McMahon at WrestleMania XIX, a storyline emerged in which Vince ordered Hogan to sit out the rest of his contract, not allowing him to appear on WWE television. Almost immediately, promos for the mysterious Mr. America began airing on weekly programming. Stephanie McMahon inked the yet-to-appear superstar to a deal with Smackdown, and the patriotic grappler made his much-anticipated debut on an installment of Piper’s Pit. 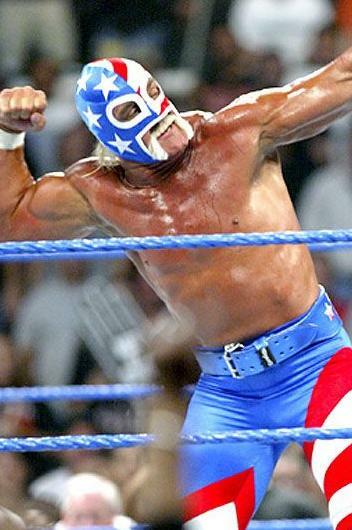 The WWE didn’t risk anyone not realizing that Mr. America was indeed Hulk Hogan – he used Hogan’s music, performed his taunts, and even included his trademark “brother” in his interviews. Mr. America vehemently denied being the Hulkster though, going so far as taking a lie detector test to prove that the two weren’t one in the same. What was the ultimate plan for the Mr. America character? The world may never know. Before the story could run its course, Hogan, frustrated with the creative team and not satisfied with his rate of pay, quit the company. Was there a plan at all? I’d be inclined to think not, and if there was one, I’m sure it wasn’t very good. Hogan’s last match in the WWE was wrestled as Mr. America, a 6-man tag contest in which he teamed with Kurt Angle & Brock Lesnar to lose to The Big Show & The World’s Greatest Tag Team. Interesting piece of trivia: The mask worn in the video below of Mr. America’s debut and the one pictured above differ because of Marvel Comics citing that the original was too similar to the one worn by Captain America. Not the first time that Marvel has taken exception to wrestlers ripping off superheroes. Previous articleRaw Roundup: Power to the People?